It seems like winter and meditative snowy days have gone too fast. Life is emerging again. With each year comes spring and its renewal, the thrill and excitement of endless possibilities. Staying true to our seasonal way of releasing music, we're glad to feature the craft of passionate artists for this year's edition of Spring Vibes. Discover the crafts of Adonai, Anemoia and Boti, Eric Lune, HaZa, Kamangâ, Mozaik, Mynox and AsK, Ras Algethi, Shunus, and Teom. Let's dive into spring with this carefully curated 10 tracks album. Ras Algethi enters our music family with quite a beauty: 'Stay Here'. The instrumentation of the track is minimal and hypnotic, using the stabs as a drone staying on the melodic key up to the break. When the break drops into the last part, the harmony shifts toward a beautiful chord progression sublimed by airy ethereal vocals. HaZa's 'Sway' has a delicately crafted and dynamic rhythmic section. Elements evolve through subtle yet relevant automations. As always with the Parisian producer, the synths have a retro feel and express through a creative use of LFOs, creating bouncing rhythms. At times, we get caught listening to background details such as the vocal choirs and the subtle arpeggios. Yerevan based Teom, whose talent was revealed to our audience on the Winter Vibes II album has come back for our greatest pleasure. The magic has happened again with 'Khio'. The Armenian vocals are captivating and emotional. Once again, the craft of the percussions and their display in the stereo field is amazing and a real treat for the ears. Can sounds be fluffy? Well it definitely is what Teom's sounds feel like. The Dub mix provides an alternative to the original, emphasizing on the grooves... perfect for a club environment! Shunus has been delivering so much quality music lately. We can only be proud to release 'Jiro' to transition gracefully into this year's new season. 'Jiro' is a laid-back dreamy track blending beautifully crafted chords and melodies evolving through keyboards, violins, and harp sounds. The ethereal female vocals add a touch of mystery to the equation. Indeed, there is some tension at times, which conveys a very special mood to this beauty. Anemoia is a duo from Tunisia who has been active for a few years now. They join Art Vibes with 'Lavendé', produced in collaboration with Boti. The production features high-pitched electric guitar melodies layered on top of ethnic percussions and a sweet match of kick and bass. Eric Lune, Australian talent from Melbourne, trusts us once more to release his progressive pearl 'Windsor Dukes'. Chopped female vocals follow the underlying uplifting chords, harmonizing beautifully during the drops. Listen carefully as some synths emerge from the background and bring that extra melodic flavor we all crave for. Mynox, from french duo Pandhora and AsK have teamed up to craft 'Shyva'. The main theme is played with a plucky sound whose echo sweeps the stereo field, giving an interesting movement to the melodic pattern. The last drop of the track is deep and its chords progress beautifully as the airy female vocals come in. French duo Mozaïk make their debut on the label with 'Jam in the Jar'. The layered arpeggios bring a very melodic touch to the production, which has otherwise a more straightforward basis, solid low-end with synthetic drums. Nevertheless, the lower toms and the darbuka patterns bring an ethnic feel to the overall vibe of this groovy jam. French producer Adonai returns to Art Vibes with 'Senses', a pretty delicate track, sounding rightfully organic and uplifting. The chord progression is authentic and conveys an interesting tension. The synths are slightly detuned and creatively sound designed. Whether you're listening to the lush arpeggios or the airy lead sounds, immerse yourself entirely into an ocean of mellow sounds. 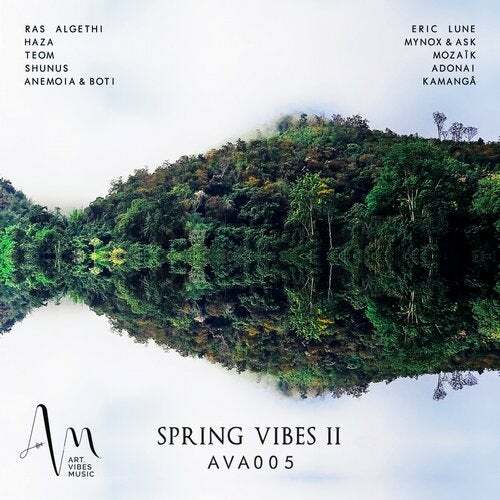 We're glad to have Max Tenrom's new duo Kamangâ for Spring Vibes II. The guys from Toulouse, France have delivered a sumptuous piece full of well sound designed synths, gifting everyone with the dreamy 'Mazolina'. Synths and keyboard sounds alternate throughout the track, blending different timbers and sharing the same space. They sound distant and ethereal, even atmospheric at times. Spring is a thrilling time of the year, isn't?